Photo by David Tracy. Art by Jason Torchinsky. After two of my vehicles—my 1986 Jeep Grand Wagoneer and my 1948 Willys-Overland CJ-2A—decided to crap the bed this week, I received a reminder that the best way to fix a car isn’t to simply replace components, it’s to understand how the components failed in the first place. A couple of weeks ago, my Grand Wagoneer, Project Redwood, left me stranded in a Burger King parking lot when it stalled, and its starter motor was unable crank the engine over even after I jumped the solenoid. This meant I had to walk two miles home in 90 degree weather with a backpack full of stuff (I was on my way back from the airport), bring some tools to the Woodie via my Willys, and try to make some repairs. The situation wasn’t what I’d call “optimal,” but I wasn’t mad. Project Redwood is awesome, no matter how many times it leaves me stranded. With the help of a five pound sledgehammer, I was able to get the starter to turn the iron-block V8 over enough for the Jeep to fire up so I could get the heck out of that greasy-smelling Burger King parking lot. Within a few days, the sledgehammer method no longer worked, and the Jeep was stranded in my yard. Lucky for me, a new starter motor was less than $45 from O’Reilly Auto Parts, so I picked one up, spent about 10 minutes unbolting the old motor and cursing about how little ground clearance the spring-under-axle Grand Wagoneer has, and then threw the new motor on (it’s just one bolt to hold the battery cable and two to hold the motor to the transmission bell housing). I pushed the key into the Saginaw Steering column, gave it a twist, and the AMC 360 fired right up. Redwood was back on the road. Fast forward to the next day, when I tried cranking my 1948 Willys CJ-2A to go for a pleasant summer drive. I turned the coil on with the key, depressed the clutch, and pushed the starter switch with my right foot. I hopped out and checked all the connections, then tried again. Still nothing. So I banged on the starter a few times, and when that didn’t work, I tried bypassing the foot switch and battery cables by just hooking up some jumper cables from the motor directly to the motor. I saw sparks, but still no motion. Having just replaced the Grand Wagoneer’s starter the prior day, having seen how expensive a six-volt starter is for an old Willys, and having successfully rebuilt the CJ-2A’s bone-simple generator, it was clear to me that I wasn’t about to buy a replacement part without at least trying to fix this motor. Somehow, a little metal chunk of what appears to be a needle roller got into my starter motor. I removed it, lubed the brass bushing while I was in there, and put it all back together. The Willys cranked and fired up in an instant. This was my monthly reminder that, when something breaks, figuring out the failure mode is critical; it not only helps you understand how a system works, but it can save you a bundle of money. 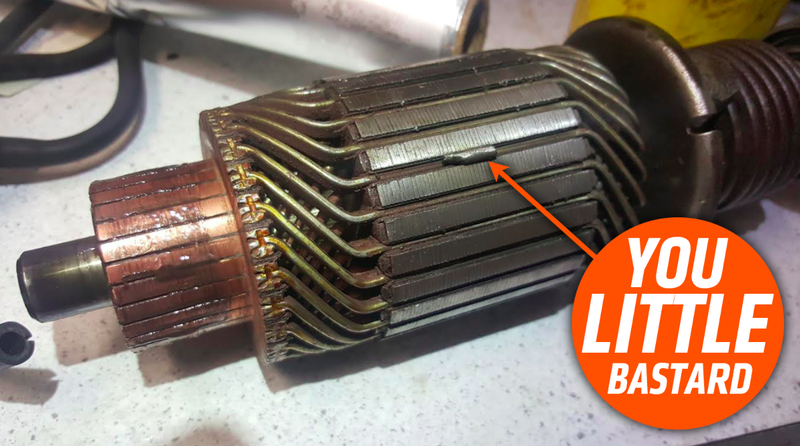 Most people would likely have just said “Oh, the starter doesn’t work, time to buy a new one.” But consider this: just looking inside my motor may have just saved me $100; And perhaps I could have saved $45 had I torn open my Grand Wagoneer’s motor, too. Granted, it’d be nice to know exactly how that little needle got into the starter in the first place so as to prevent something similar from happening again (I suspect it has something to do with a deep mud pit my friend drove the Willys through recently). But for now, I’m just glad I’ve turned two dead vehicles into runners for a mere $45. Don’t just replace car parts. Figure out why they failed—I don’t do this all the time, especially when the parts are cheap and the components are complex, but we should all strive to do it as often as possible.